Till date before Acer Predator Helios 700 is launched in market, the company was not able to stand by as the well known tech giant called Alienware. This company actually attempted to revolutionize the desktop replacement with its gaming laptop model called Area-51m. 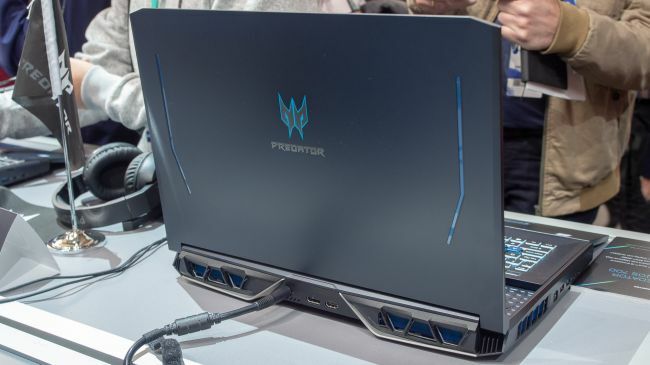 But now, in order to complete Alienware, Acer even has launched its brand new Acer Predator Helios 700 flagship gaming laptop which appears to be really good enough. So, in this article we are going to provide you details about Acer Predator Helios 700 specs, review, price and all other details which you might love to know. So, all as it’s mentioned that the new laptop from Acer is absolute latest and very powerful model with mobile PC gaming hardware inside, along with other clever innovations as well. Means, the company is going to stand by with Alienware and also to other products which comes under same category. If you are a game lover and need such a computer that have the most powerful specs to support every game, investing in this Acer’s new and powerful laptop can be a good idea. With the launch of powerful Acer Predator Helios 700 specs, the company seems prety mum on the specifics regarding its price and configurations. But, it’s expected the the new flagship gaming laptop will be sooner available in US in April and even in Europe till July. Speaking about its price details, it will be sold in market with starting price of $2,699. Means, laptop is really going to be a very costly gaming laptop with definitely a very serious hardware configuration inside to match that price level. But unfortunately, we don’t have any idea how the Helios 700 internal configuration in detail, but at least, it’s going to house Nvidia’s RTX 2070 graphics card. Also, the Acer has recently revealed that the laptop will have up-to 9th-generation core i9 process paired with as much as 64GB of RAM. Getting through more of the details about Acer Predator Helios 700 specs, it will include Wi-Fi 6 for great wireless connectivity, 17.3-inches Full HD IPS display running at 144Hz refresh rate and the latest Nvidia’s G-Sunc technology which has 3 ms (milisecond) of response time. Getting through the design of Helios 700 by Acer, the laptop is really a very unique desktop replacement gaming laptop. 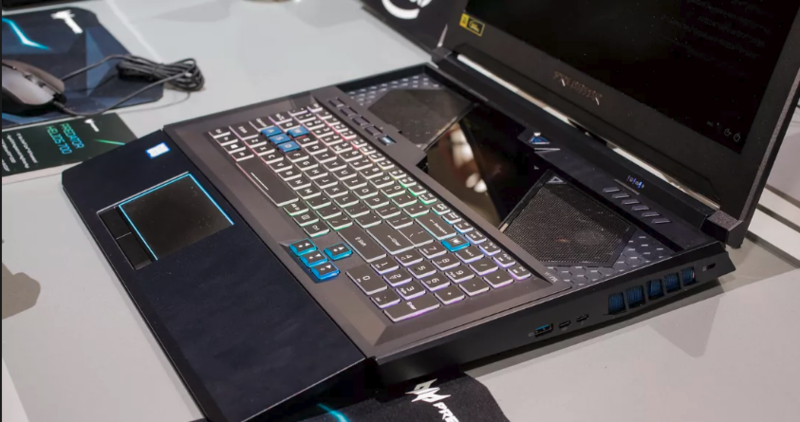 It’s featured with a HyperDrift keyboard deck that can slide forward along a rail to reveal the lappy’s cooling fans. According to company’s claim, pulling the keyboard forward will boost the system’s overall performance around 20% after the special “Turbo button” is pressed. Pulling the laptop’s keyboard also reveals some neat RGB lightning which adds a curb appeal to lappy as well. Doing so will even cause the trackpad to fall a bit at an angle and seems creating a pseudo palm rest of sorts. Many has to say that the feature particularly is a very handy feature as it invites the player to use the included keyboard. Also, this is designed in such a manner that it can help gamers as well. Also, the keyboard includes ‘WASD’ keys which actually uses a different switch than others. These key switches are actually designed to respond and actuate at different levels of pressure and travel much deeper inside. But, when you need these keys to be work normally, they will get replaced with traditional key switches and allow you simply to type rather than playing games. Coming to the trackpad, it seems find in terms of accuracy and feel, but its glass coated surface rather than plastic coating is really appreciable. it’s tough enough to glean much regarding the display in a glaringly lit environment. But, the display included in this laptop since has a great refresh rate of 144Hz along with G-Sync technology, there’s hardly a chance that the display will produce any jittery visuals. Being a desktop replacement laptop, Acer Predator Helios 700 specs causes it to be rather thick and heavy, but we have exactly no information how much this would be weight, so far. Apart from these, the device includes 2 USB-C ports, 3 USB 3.1 ports, HDMI port, Display port as well as an Ethernet port for connectivity. While saying about Helios 700 Specs’ performance, it’s really very difficult to say and judge its performance based on minutes usage at press event. But considering the hardware it has included, the laptop is really very promising and will offer amazing performance. Getting over its under hood specs, it includes full-fat Nvidia RTX 2080 GPU, 9th generation Intel Core i9 CPU wit overclocking capabilities and offcourse a Turbo Boost mode with improved thermals, etc makes it really hard to consider laptop’s performance will be poor. But, what’s seems to be bothering in case of strong Acer Predator Helios 700 desktop replacement gaming laptop, is its battery. it’s a complete spoiler and none should expect the device will last very long off when not connected to power supply. 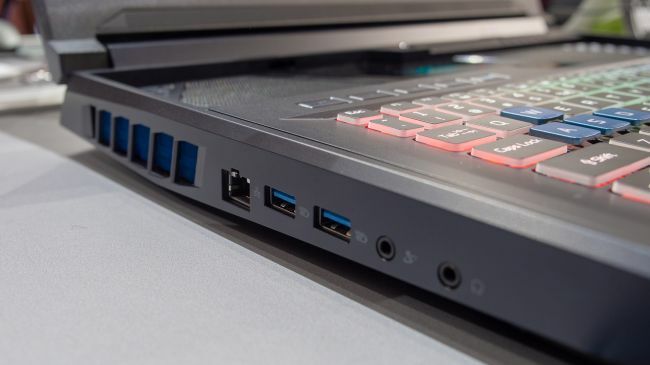 So, based on all its internal details and specs which it features, the Acer Predator Helios 700 specs seem to be very impressive gaming laptop that cleverly uses its size to bring amazing performance. Also, it’s appreciable that Acer has taken the enormity of its laptop into consideration with the new HyberDrift keyboard and megaforce switches on WASD keys. But. This seems not much able to convice game lovers to leave their dedicated gaming keyboards. Well. So far we are also attempting to collect more details regarding the device and update the same here once got. Below are some pros and cons that you might like to know as of our inspection. 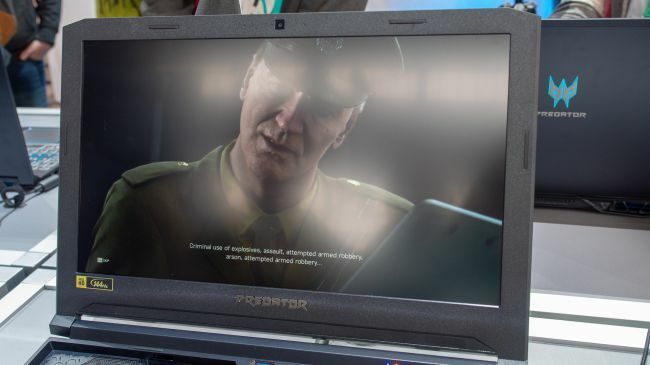 In case you liked this article about Acer Predator Helios 700 Specs, then please share it to your friends and let them know about this brand new Acer’s gaming laptop. Also, Subscribe Us to stay tuned with more similar reviews and tech articles on Techsmagic.